A few days ago, my sister kindly gave us some squid ink pasta. We thought that this definitely needed to be paired with something else related to the sea. Initially we planned to have it with actual squid, but were defeated at the last hurdle in our search and ended up with mussels instead. We followed a moules mariniere approach for the mussels and then mixed them into the pasta and served with a dollop of sour cream. The pasta was fresh tagliatelle and cooked very quickly, giving a lovely texture that was at once both firm and yielding. Every time we have fresh pasta, we love it but don’t have it very often; clearly we need to practice making it ourselves. The squid ink gives a lovely deep, (ironically) earthy flavour to the dish. I was trying to think of a wine that would pair with this and thought that a Cava with a lot of Xarel-lo in it would be good; light and fresh tasting but with an earthy body. Unfortunately we didn’t have any and made do with a light, South African sparkling wine which turned out to be a reasonable substitute. Subscribe to comments with RSS	or TrackBack to 'Squid Ink Pasta with Mussels'. 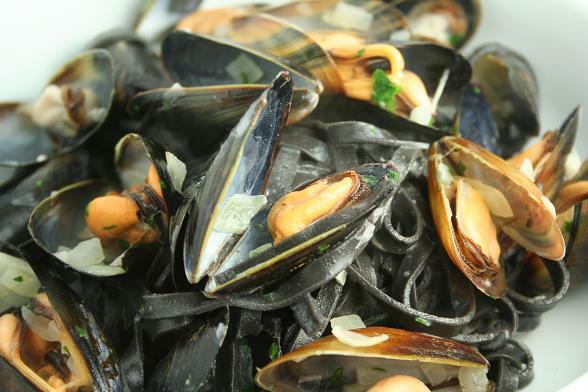 I still haven’t had squid ink pasta… I’d love to have a go at making it myself. Imagine the mess! Oooh, I love squid ink pasta – haven’t had it for ages. Now have a craving for it! Sadly I have never had any fresh pasta! Yours must be sooooo good!